Miss Wallace, Mr Waterfield, Miss Truman and Mrs McConnell are very excited to be working with Year 6. If you have any questions, please ask at the door or email myteacher6@sherrier.leics.sch.uk. The Autumn term was extremely busy for Year Six: the Caythorpe residential, writing adventure stories, learning about (and creating our own!) inventions and making a great start to maths by securing our knowledge of written methods. The Spring term promises to be just as jam packed as we delve further into our topic 'A Child's War'. Read on below to find out more! 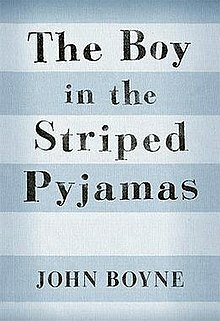 Our Reading and Writing sessions this term will focus on the text 'The Boy in the Striped Pyjamas' by John Boyne. As we read more of the book, we will update this page with key questions and vocabulary that we have been discussing in class so that you can share this learning with your child at home. We understand that this book can raise questions about significant and upsetting historical events, so if you or your child have any concerns please speak to a member of the team. Each week, children are sent home with a list of fridge words. For homework, we would like you to discuss the meaning of these words and try to use them in everyday situations. customary: a person’s usual practices associated with a particular society, place or set of circumstances. splendor: magnificent and splendid appearance. efficiency: working in a well-organised and competent way. overawed: impressed so much that the person is silent or inhibited. insolent: showing a rude and arrogant lack of respect. This year we will be teaching Maths through a scheme called Power Maths. As we start a new unit, we will update this page with the essential vocabulary, learning objectives and key questions that we will be discussing. Use the drop down boxes below to find out more about each unit. In this unit we will be consolidating and learning effective methods for the four operations. The image shows the vocabulary that we will be learning as well as the models and images that will be useful. It was lovely to see so many parents and carers at our SATs talk and open afternoon. We hope you found the presentation informative and that your enjoyed looking through the children's work so far. If you weren't able to make it, we have added the presentation to the Year 6 SATs information page. Please come and ask if you have any questions. We had an extremely informative and exciting day exploring the Warning Zone in Leicester. During the day we had the opportunity to learn about online safety as well as the dangers in real life. Please click on the links below to see any Year Six specific letters that have been sent home. We have included the homework schedule and the Easter Revision Session Letter. We will regularly post updates of our exciting learning and latest news on Twitter, so please make sure you request to follow @SherrierY6. At the end of the half term we sent home the list of Year 5/6 spellings that your child should know. Click on the image below to download the list. Our P.E day will be Friday. Please ensure children have kit in school at all times in case we have an opportunity to get moving! X Factor homework has been sent home in the children's new homework folders. Homework will be sent out on a Wednesday and needs to be returned by the following Tuesday. Your children have also now received their Reading Records and books. Please make sure you are signing these. Fancy doing some additional homework tasks? If so, pick something from this list! Just click here for more information or open the document below. Our first topic of the Autumn term is called 'Tomorrow's World'. In this topic we will be researching famous inventions which changed the world and creating our own inventions linked to the mechanicals from our class novel, Cogheart. This handy document will tell you the main facts and vocabulary we will be learning in our topic, 'A Child's War'. The Year Six children are growing up quickly and are getting ready for life away from Sherrier School. As a school we care about the "whole child", not just their academic success and so keen to see them flourish in all areas of their lives. As they grow up we recognise that the value of "forgiveness" will be key as they build relationships with others. So as a year group we will be ambassador for the christian value, "forgiveness." Throughout the year we will be exploring the other values adopted by Sherrier pupils but we will be focusing on what it means to show forgiveness in class, on the playground and at home and encourage others to do the same! If your child impresses you with how forgiving they are at home do share this with us by making a note in their Boomerang book so that we can celebrate it in class. • Letting someone off - is that fair? • Is there a limit to forgiveness?